I used Hot Cocoa Whiskers and a Sweet Sunday Sketch. I stamped the image, colored with Copics, and paper pieced just the cup with a scrap of the same paper. I used a craft knife to cut around Whiskers' hand so that the paper pieced cup would go underneath it. I added the charm with a double-bow and a sentiment from Papertrey Ink. I hope you like it! We'd love to have you play along with us! All the details can be found on the La-La Land Crafts blog. TFL! 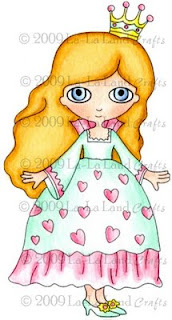 I stamped Angel Lala, colored her with Copics and paper pieced her dress. I spread Stardust glitter pen all over her halo and wings with a waterbrush, and then glued superfine glitter to just the edges of the halo and wings for a little extra sparkle. Lastly, I cut her out and mounted her foam boosters. For the frame, I stuck some Basic Grey paper to self-adhesive magnet sheet and cut out the frame using an old Sizzix die. I tied a bit of ribbon around it, stuck a beaded pin in the knot, and added on Lala. I thought this would be the perfect way to stick pictures of your little angel on the fridge! We hope you'll play along with us! All the details can be found on the La-La Land Crafts blog. TFL! Pure Innocence Pile It On! I have a Pile It On! card today and I'm sad to say it's my last one for my term as a DT member. I had a lot of fun and am so happy I got the chance to be on the DT - I am now a huge fan of combining challenges (and of challenges in general!) and I owe it to the PIO! gals Dalis and Vickilyn. Thanks so much for having me on the team!! I used this adorable winter image from Digi Stamp Characters by Heather Ellis (the Pure Innocence line). I printed her out and colored with Copics. I accented the snow with a little glitter and used some pretty Basic Grey papers from the Eskimo Kisses paper pad. 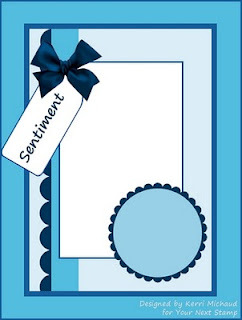 The sentiment is from the Elegant Christmas set from The Cat's Pajamas. Our Creative Corner - Let it Snow! I hope you like it and that you'll play along with us! All the details can be found on the Pile It On! blog. TFL! If you're looking for the La-La Land Crafts' Fairy Tale Release Blog Hop, it's the post directly below this one. Thanks! I used the set Let It Snow and some super cute papers from My Mind's Eye. I stamped the snowman twice and colored with Copics. I cut out one full snowman and then just the hat and scarf from the second and layered those pieces on the first with foam boosters. The whole snowman was also popped up on foam boosters. The snowflake was cut from glitter cardstock with a Sizzix die and I tied a button to the center with crochet thread. I distressed all the edges of the papers and did some machine stitching to finish it off. Finished card size is 4.5" x 5.5". We hope you'll play along with us! One lucky participant will be drawn at random to win the Cupcake Cutie Single Stamp!! You don't have to use YNS images on your card, but if you do you'll get a double entry in the draw! Also, the challenge hostess will choose her favorite card, and that winner will get the YNS Challenge "Top Pick" blinkie to proudly display on their blog PLUS a $5 gift certificate to spend at the Your Next Stamp store! Full details can be found at the YNS Challenge Blog. TFL! 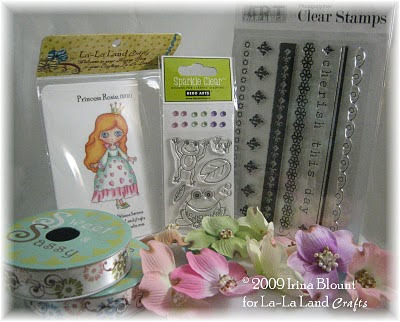 Welcome to La-La Land Crafts' Fairy Tale Release Blog Hop! To celebrate the release of our new Princess Rosie stamp, we are giving her the royal treatment that she deserves. Every member of our Design Team and the Guest Designers have made their cards with Princess Rosie which we are now showing on our blogs. To make the Blog Hop even more fun, along with the cards you will find some clues (a secret word or two) on every blog. When you follow the order of the Blog Hop and get to the end, you will have collected all of the words and will be able to put them together into a sentence. When you are done, you will need to go back to the La-La Land Crafts Blog and leave a comment on the Fairy Tale Blog Hop post. If you came to me from Katie's blog, then you're on the right track! If not, then you'll want to go back and start at the La-La Land Crafts blog and hop to all the stops! What's even more? While on your treasure hunt for secret words, you might even find some more treats offered by our designers!! And best of all, I have some great news for you!! The Princess Rosie stamp is already available for purchase in our online store! What do you have to do to join our Blog Hop? * Final stop is back at the La-La Land Crafts blog where you have to leave a comment on the Blog Hop post. IMPORTANT - Do not reveal your answer in your comment!! We will contact the winner for the answer. If the answer is incorrect we will draw the winning number again. One entry per person please. We will draw the winning number from all the entries next Wednesday, December 23rd, around 10 am PST. Everyone is welcome to participate. We will ship internationally!! And now, it's time for my card! I stamped Rosie twice and colored with Copics. For the bottom layer, I cut her out, leaving out the crown and the hand on the right side (they're so small, they just didn't look right under the top layer). For the top layer, I cut her out, leaving out the bottom ruffle of the dress and her legs and shoes. I also added a bunch of tiny rhinestones and glitter pen to Rosie and the patterned paper. The papers are from Imaginisce and the sketch is from Unscripted. I hope you like it! My secret words are "the courage." The next stop on the Hop is the fabulously talented Kristine. Thanks very much for joining us for our Blog Hop! Hello everybody! Thanks for joining us for another fun and fabulous Your Next Stamp Blog Hop! YNS just released a new Fhiona set (Fitness Fhiona) and a bunch of Cute Little Buggies and Animals so the Starlets (and 2 awesome guest designers!) have whipped up some eye candy using many of the new images. If you came here by way of Lana's blog, then you're on the right track! If not, please go back and start at Karen's blog because you won't want to miss a stop - one grand prize winner will be randomly drawn to win 6 of the new releases of their choice!! To qualify, you need to comment at all the blogs on the hop with the answer to this question: Which new release stamp/set is your favorite? One last thing before I get to my projects for today - Karen is offering a super special while the Hop is on (Dec. 10 - 14 at midnight EST) - a FREE stamp or stamp set of your choice from the YNS store with a purchase of $55 or more!! I colored Sammy with Copics, then cut him and the mat out with Nestabilities. The tree paper is from Upsy Daisy Designs and I made the sentiment myself using 2 different alphabet sets (the smaller one is from Papertrey Ink and the larger is Close To My Heart). I finished it off with some sponging, light distressing, and a couple buttons tied with twine. I used the new super cute Bee Stings and some really old Imaginisce paper. On the box, I popped up an extra head for the bee for dimension, but I left all the notecard images flat for easy mailing. I computer generated a sheet with the sayings placed so that they would end up where I wanted them (it took me many tries to get it right, but now I have a template I can use whenever I want!). After printing, I just had to do a little trimming to get them down to the correct size. If you're interested, the sayings are Don't worry, bee happy!, Buzzing by to say hi!, What's the buzz?, and Just bee-cause! The bees were all colored with Copics and I added Stardust glitter pen on the wings. I embossed the yellow strips with the Birds and Swirls Cuttlebug folder and stitched buttons to the box. Thanks so much to Cindy and Val for the inspiration and especially to Val for the great project and tutorial! Just a quick reminder - there's still time to enter the YNS Challenge #5 - make a birthday project with hearts. The deadline is December 15 and all the details can be found on the YNS Challenge Blog. I hope you liked my projects and thanks for hopping along with us! Your next stop is the incredibly talented Maylee. Yay! Wednesday means it's time for another La-La's Weekly Wednesday Challenge! This week our theme was set by Lisa and is a color challenge: Lisa says, "I'm loving the 'new' Christmas colors of pink and green... so the challenge is to use pink, green and a neutral in your card." I used Ornament Lala and the Sweet Sunday Sketch. I stamped Lala and colored her with Copics. For once I didn't cut her out and pop her up with foam boosters (to save some time). I used some old Daisy Bucket papers, a few buttons, ribbon, and a rub-on from Making Memories. Christmas Michu Pile It On! I printed Christmas Michu (who can be found in the Softpencil Etsy shop), colored him with Copics, then cut him out and popped him up on foam boosters. I also flocked his hat and coat trim for some extra texture. For the snowy ground under him, I drew a line with a black liner pen, and then glued on some homemade Flower Soft, that I like to refer to as "Holly Soft" (you can find the tutorial on Holly's blog here), mixed with a bit of iridescent glitter. Quixotic Challenges - "Be Charming"
Little Red Wagon - "Heavy Metal"
Stamp Something - "Glitzy Somethings"
We'd love to have you play along with us! All the details can be found on the Pile It On! blog. Also, if you'd like to play with a holiday Michu image, Elizabeth has an adorable freebie posted on the Paper Craft Planet group! TFL! If you're looking for the Your Next Stamp Challenge #5, it's the post directly below this one. Thanks! Wednesday means it's time for another La-La's Weekly Wednesday Challenge! This week our theme was set by our DT Coordinator Jane, and is Buttons! I love adding buttons to my cards so this was a great challenge for me! I used Birthday Lala and gave her a haircut again, like I did with this card because I really love the short sassy 'do! I also used a really fun sketch from Sketchy Thursday and some super old papers from a company that's since gone out of business. Lala was stamped, colored with Copics, cut out and popped up on foam boosters. I did a whole bunch of sewing and added a couple Prima flowers, and of course, buttons! Lastly I stamped a sentiment from Papertrey Ink on a thin strip of cardstock and then snipped down to almost the bottom to make the strip able to follow the curve of the circle (I got the idea from this post by Debbie Olson). I used Cupcake Cutie Fhiona and a great sketch from PaperPlay Challenges. I also finally used some of this super adorable Doodlebug paper that I've been hoarding for months! I stamped Fhiona and colored her with Copics. Then I cut her out using a circle Nestabilities die and because I felt the whole thing was too white, I sponged the edges of the circle. Then I sponged the patterned papers to match. I added a couple heart brads, heart buttons, machine stitching, ribbon, and a sentiment from Papertrey Ink. We hope you'll play along with us! One lucky winner will be drawn at random to win the Shopper Fhiona set!! You don't have to use YNS images on your card, but if you do you'll get a double entry in the draw! Also, we'll have a Top Pick winner (not a random draw) from all the entries that will get a $5 coupon for the YNS store! And last, but certainly not least, if you can't play along, leave a comment anyway because one commenter will be drawn at random to win a $5 coupon to the YNS store! Full details can be found at the YNS Challenge Blog. TFL!